A trip through the Gorge on my way back to Portland from points East finally gave me an opportunity to visit Double Mountain Brewing. I stopped by one day last summer and found the place shuttered. Turns out they were in the midst of a major renovation/expansion that tripled the size of their space. Next up: their 6th Anniversary Party in March. These guys are hardly a secret. They've been around since 2007. 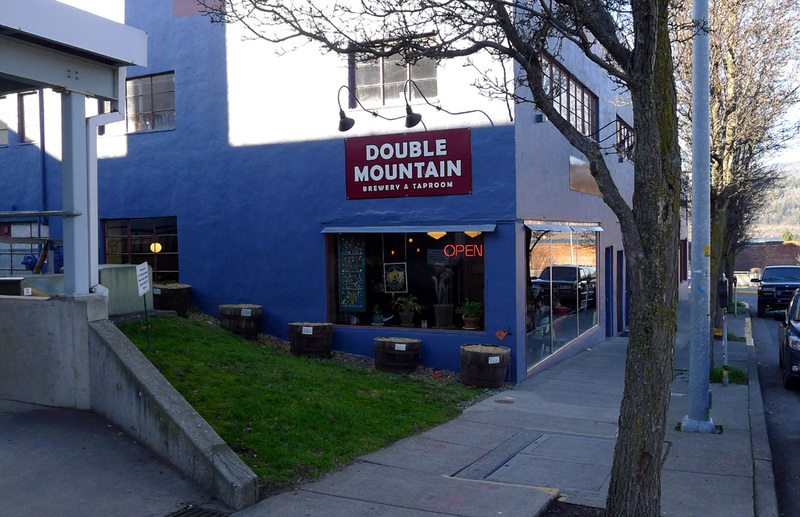 Double Mountain beers are well known in Oregon, having been available on draft for quite a few years. It's only been in the last six or so months that we started seeing bottles in stores...thanks to last year's expansion. What happened here is a nice success story. Co-founders Matt Swihart and Charlie Devereux met many moons ago while working at Full Sail Brewing. Different career paths intervened before they eventually came up with the idea of starting their own brewery. It turned out to be a great idea. Fast forward several years and the business was bursting at the seams, out of space in its original location. Even with offsite storage, they didn't have enough seating and were in dire need of more room for production activities. Their options were find another, larger space, or acquire more space where they were. As it turned out, they were able to stay put by negotiating a deal to buy space in essentially the same building. This is the kind of thing you can do when you have a successful brewery and a solid business plan. Not just anyone could swing something like this. The new space works well. You enter the original pub, which apparently looks pretty much as it always has. Take a right turn (through a hole punched in the wall) and you enter The Garage, where there's extensive seating, as well as a stage in the distance. The so-called North Bar looks out on this immense area. It was mostly empty when I visited, but it is a visually appealing space. 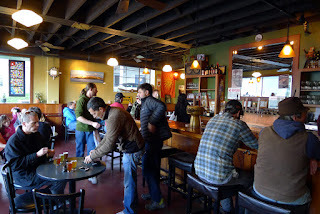 To the west of the North Bar is the brewing area. If you walk to the end of the hallway and look to the right, you can see the new production area through double doors. 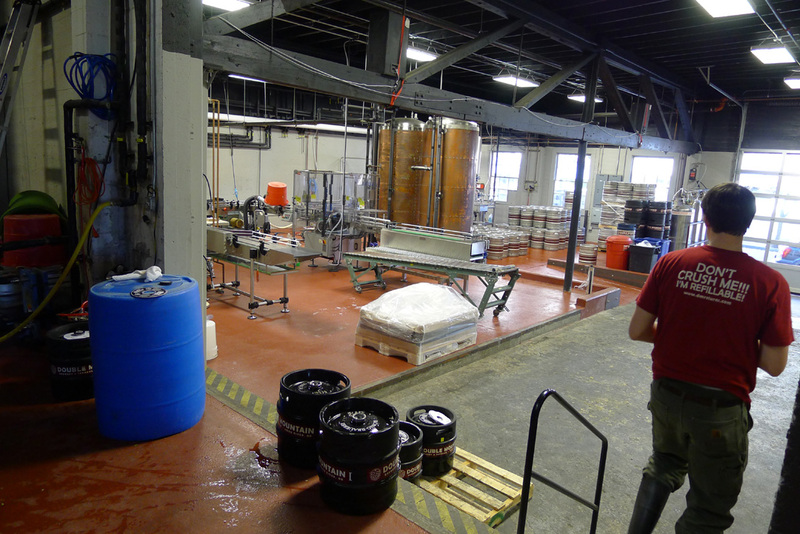 As important as the added seating is in The Garage, the production area is the heart and soul of the expansion because it allowed them to add a bottling line and automate kegging. Double Mountain bottles started appearing in stores late last summer. The plan from day one was to distribute the year-round beers...Kolsch, Vaporizer, IRA and Hot Lava. A few seasonals have appeared, as well, such as the winter ale, Fa La La La La. These bottles are easy to spot because they are an odd shape and size. Wanting to take a different path than their competition, Swihart and Devereux opted for 16.9 oz. hand grenade bottles. These things are apparently popular in Europe. They are also refillable, a nice touch from a green perspective. To me, the bottles are an oddity. They look funny on store shelves. I realize a visually unique presence was part of the plan, but I can't help thinking these things look out of place...kind of like Base Camp's 22 oz. aluminum bottles. I also wonder how many of these bottles make it back to the brewery for refilling. I bet not many, but perhaps I'm wrong. There's info on return locations here. 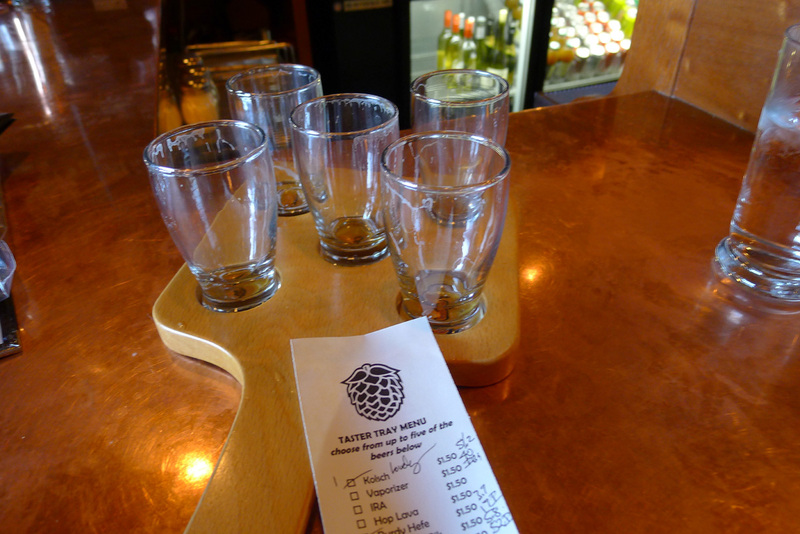 As for the beers, I won't spend a lot of time talking about the standards. Double Mountain's year-round beers are generally well-executed and they've developed a solid following in draft and bottled form. I'm not a big fan of the bottled versions because I think the beer loses something in translation. But it's as good as other bottled products out there. 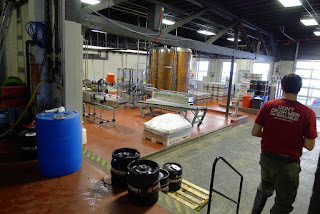 A trip to the brewery is essential to fully appreciate what these guys are up to. Someone recently told me I could expect to find fantastic beers that will never be seen outside the Hood River headquarters. Sure enough. 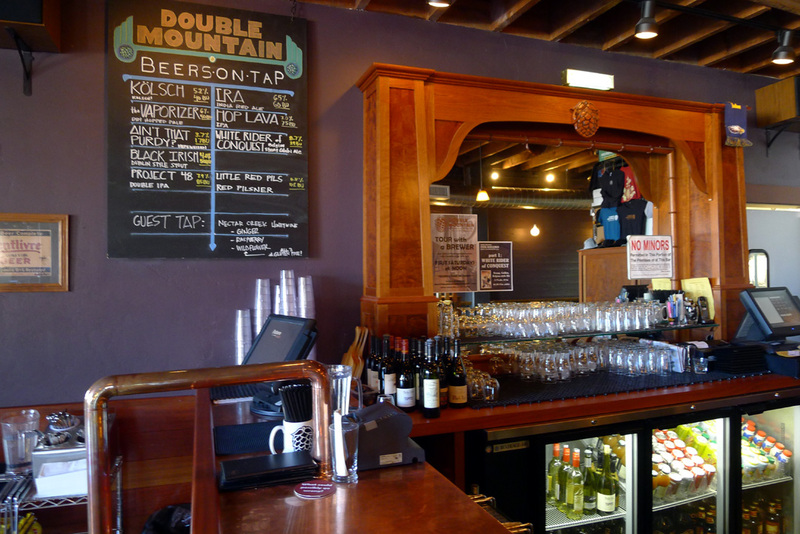 Double Mountain operates a 20 bbl system that features hand-me-down parts from many established breweries. I didn't count fermenters, but they obviously have more than a few. Otherwise, they would have trouble keeping up with demand. One of the cool things about their brewing setup is they are able to produce small 6 bbl batches using just the bottom of their kettle. I don't get the specifics of how that works, but never mind. Guess where those specialty batches typically wind up? 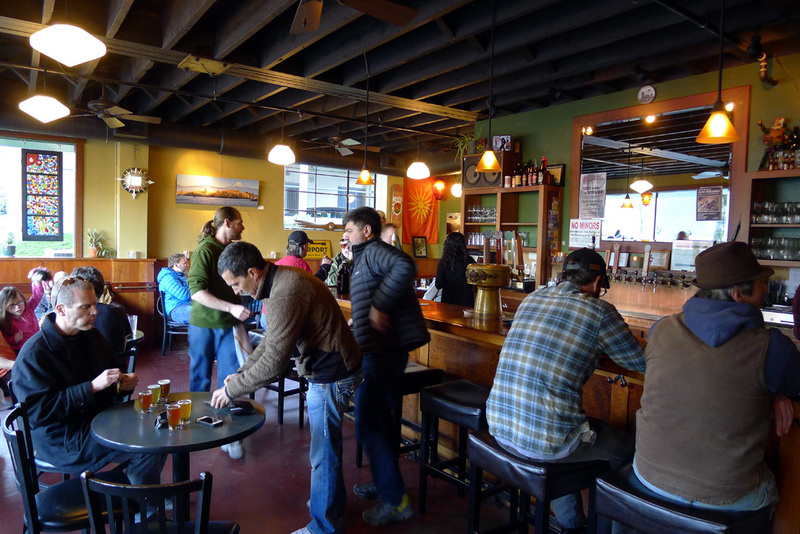 If you guessed the Hood River taproom, you're a winner. I stayed mostly clear of the standards on my visit, because I know those beers. The exception was the Kolsch, which I wanted to taste fresh. 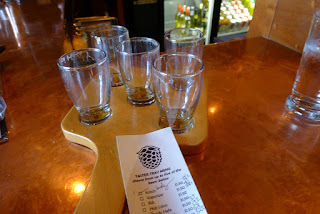 My tasting tray also included Ain't That Purdy (German-style Hefeweizen), Little Red Pils, Project 48 (Double IPA), and White Rider of Conquest (Belgian-style blonde). 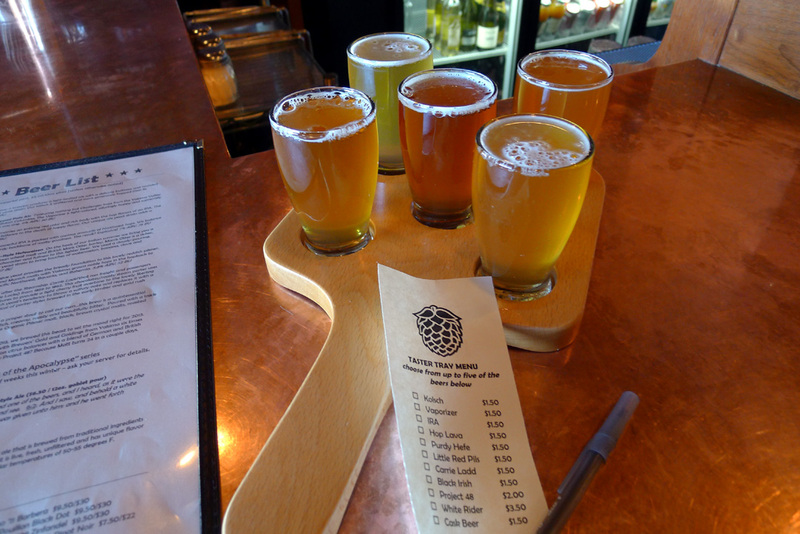 These beers are all well-executed. The Kolsch may have been my favorite or maybe it was White Rider or Ain't That Purdy. Tough choices. Double Mountain is ramping up for their 6th Anniversary Party on Saturday, March 16th, featuring Helles Belles, an all-girl AC/DC cover band. They'll be putting up a giant tent and they expect to offer two dozen unique beer choices, some from the brewers' reserve stash. Sounds like an excellent time for a trip up the Gorge. Pete! Nice write-up as always. 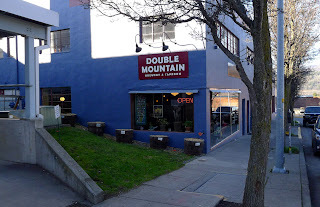 I attended Double Mountain's 5th Anniversary last year and it was a blast. They did a fantastic job. Added bonus was seeing the Meat Puppets. Hope to get down there on the 16th. 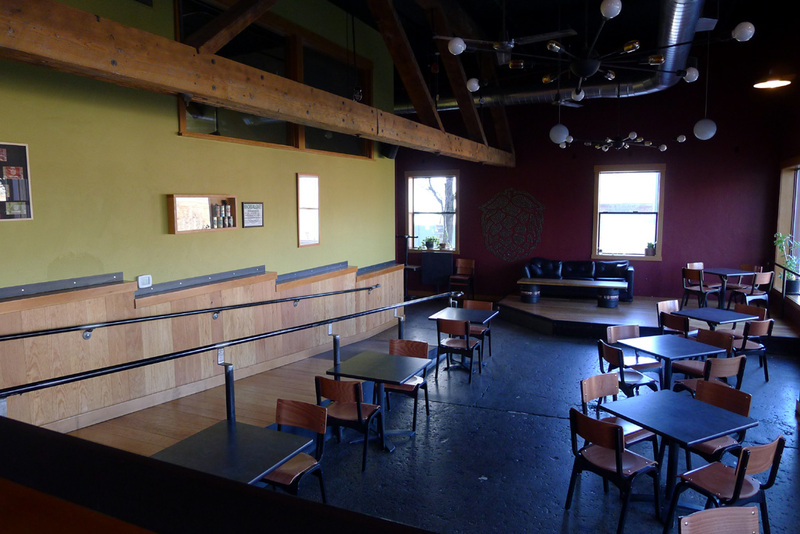 The space they've pieced together is truly amazing...a perfect place to sit and enjoy a beer or three anytime. I hope to make it out there for the big party and again during the summer, when the doors will surely be open and warm air flowing through. There's something about Hood River.